Six year old Abby lives in the neighborhood. Since 2007 HotFutbol conducted coaching seminars with nationally and internationally certified coaches from the U.S. and Europe for several hundred coaches throughout Haiti and provided professional level player training and equipment for youth teams, including the mens’ amputee teams in and around Port au Prince, as well as teams in St. Marc and Leogane. We have facilitated cross cultural exchanges between soccer teams in the U.S. and Haiti. During trainings we have offered health clinics, first aid training and partnered with the Sanneh Foundation to form the Haitian Initiative to increase our ability to train more children. In addition, HotFutbol received a grant that allowed them to build a computer lab in a school in Jacquet (Delmas 95), where the first soccer trainings began. Park Izmery is dedicated to the memory of the late Antoine and George Izmery, two brothers committed to the welfare of the poor and principles of Haitian democracy. Following the earthquake, a local grass roots committee at Park Izmery requested HotFutbol to partner with them and develop the infrastructure, operational management, and programming at the park. HotFutbol signed a lease with the land owners in December 2013 and an after-school soccer program was started, open to all children regardless of their skill level, family economic situation, or gender. All players must be enrolled in school and must pass their courses in order to participate in the program. Linking education and play, HotFutbol seeks to grow strong community leaders. As community stewards all players must adhere to a code of conduct both on and off the field allowing them to serve as an example for other children throughout the community. We have partnered with international and local NGO’s working in Haiti and believe through collaborative effort the park can become self-sustaining financially, and allow for the realization of the park’s full potential as a space that brings community members together and fosters civic engagement. All the children are enrolled in school. Every child is fed after practice. Clean drinking water is provided for everyone. 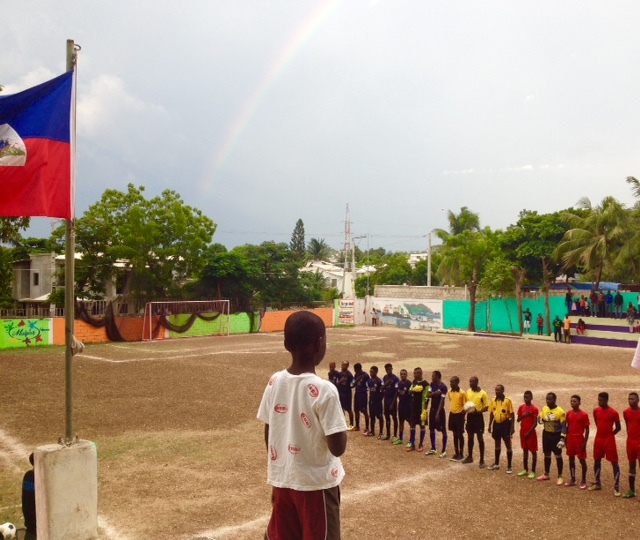 As the players walked out onto the field, the Haitian National Anthem played, the red and blue flag of Haiti waved in the late day breeze, and a perfectly timed rainbow arched over the Park. This moment captures so much of what is special about Park Izmery, the kids, and the game.